I'm back. After almost a year filled with painting, construction, decorating, starting our Airbnb business, guests and beach walks, and getting to know our new home town, winter is sneaking in the back door, making me wonder how in the world I'm going to survive our second soggy winter without the distraction of a house to remodel. I love it here, but winter anywhere always scares me a little bit. I've been trying, unsuccessfully, to pressure myself into teaching some cooking classes. I think I should, but I don't really want to. I think people would like it, but I don't think I would. I have all this training, all this experience, all this love for my plant-based life, but for some reason, I just don't want to put it out there. What I want to do is knit (or crochet or just generally play with sticks and string). It's time I started listening to those Wants, those desires, that come from deep inside, rather than the Shoulds that come from some dumb sense of obligation or fear. I'm sixty freaking years old! It's time! This is the hook that started it all. 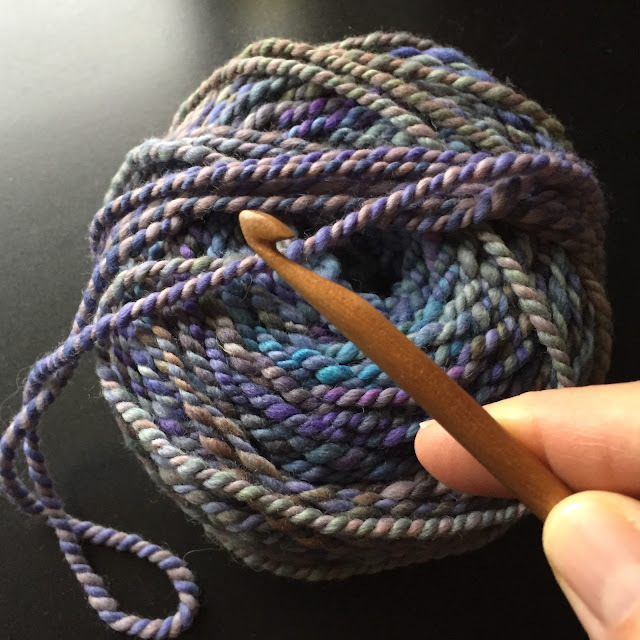 I've been knitting and crocheting since I was about 10 years old, when Mom handed me my great grandmother's hand carved hook and taught me how to loop yarn around it. She also taught me about the patience needed to not only learn the skills, but to stick with the process until the project is finished. "With every stitch, it gets a little bit bigger." Now that the house is finished, and guests are mostly gone for the season (although I want to get the secret out there that the Oregon coast is awesome in the winter), oh happy me!, I have buckets of time to knit. Knitting is my morning meditation. When I walk on the beach, or go anywhere else really, I take a small project with me, so if I have a few minutes to sit on a log, or in a cafe, or even in traffic (while Rick's driving, of course), I can knit on the go. At home in the evenings, knitting is always a part of winding down from the day. Now, with every stitch, contentment gets bigger. I'm pretty sure that knitting is what's going to get me through the winter, not only because I love doing it, or because it's gotten me through other winters (seasonal and otherwise) before, but because suddenly, once I said No to cooking and Yes to knitting, fellow knitters are everywhere I turn, ready to get together, play with yarn, and help each other through the winter. Now we're talking about something bigger than sticks and string. We're talking about new friendships in a new town, that can grow from here, stitch by stitch, while the wind blows and the rain falls sideways. With every stitch, life gets bigger. So knitting is what I'm going to talk about for a while. Other things too, sure. But this is where I am right now, on my long way home. Knitting for the love of it, the solace of it, the sharing of it. Nothing fancy. Nothing tricky or intimidating. Just the goodness of sticks and string.